Having tried a range of Android hardware since the death of Windows Phone, the Samsung Galaxy line is where I feel closest to home. The Samsung Galaxy range includes some of the best and most popular Android hardware, and it has for a long time. However, competition is heating up. From OnePlus's "affordable" flagship phones to advancing tech from Huawei and Google's Pixel line, Samsung's Galaxy phones are far from your only option nowadays. However, as a Windows Phone refugee, Samsung's Galaxy phones fall quite easily closest to home. I was in love with my BlackBerry KEY2 for quite a while, with its supreme battery life and QWERTY keyboard, but the camera on that thing barely competes with even some of the cheapest Windows Phone 8 devices from back in the day. I tried out a Huawei P20 Pro for its Lumia 1020-like 40 megapixel camera but found the software experience to be as ugly as it was rigid. I also really enjoyed my OnePlus 5T, but it's just so... boring, doing nothing exceptional. Phones should be fun. I'd always resisted getting a new Samsung Galaxy. Some of my experiences with the older phones weren't exactly great, owing to a bloated OS and prices that didn't feel worth paying, at least when Lumia was still a thing. With the landscape now (sadly) Lumia-free, and Samsung sporting the only credible phone with inking, my sorrow that the inking-oriented Surface Andromeda may never come out kind of pushed me into getting a Galaxy Note 9. My early impressions were positive, but my long term impressions have been stellar. Here's why I think Samsung Galaxy will be my home for the foreseeable future. Samsung's fantastic Galaxy S10+ is regarded as the best Samsung Galaxy phone of the now, rocking an industry-leading display, stunning camera, and tons of additional features. The Galaxy hardware is great. Though there are things I'm not a particularly huge fan of, like the curved "edge" displays on some of the models, the build quality, performance, and importantly, the range of innovation keeps the Galaxy line interesting. I also love the S-Pen for note taking on the Galaxy Note 9, and it functions as a camera shutter, too, which is something I use frequently. Samsung has stepped up with its own foldable, too, alongside Huawei. 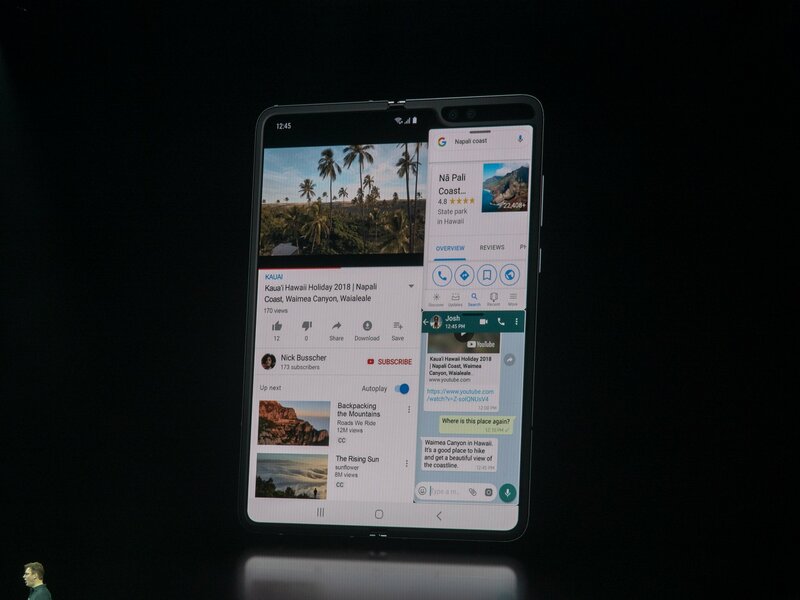 I doubt either firm will truly "nail" the foldable experience in their first couple of iterations, but at the very least, Samsung is at least trying to innovate in a recent hardware world where the most noteworthy "advancement" has been the dreaded notch. I'm excited to see where they'll push the Samsung Galaxy Fold. Beyond the phones themselves, Samsung is exploring wearables, with what is quite arguably one of the best smart watches on the market, in the Galaxy Watch . I found the Fitbit watches and even the now-very-dead Microsoft Band 2 never really maintained reliable syncing with any of my Android phones, but my Galaxy Watch is rock-solid, with reliable notifications and interesting features, like the ability to take calls directly from your wrist, Star Trek-style. The point is that there's an intersecting hardware ecosystem to explore, which to me, is reminiscent of what many of us were yearning for Microsoft to nail with its Surface, Lumia, and Microsoft Band triptych. I can already hear some of you screaming, All Android phones have customization! and sure, you can slap a launcher on Android and tailor your home screen experience, but the Samsung phones go that little bit further than most. Galaxy phones offer a level of customization that's unique in the Android world. Using the Samsung themes app, not only can you tailor the home screen experience, fonts, and iconography, but you can also change the system level visual components to match. What's the point of having a red accent color on the Microsoft Launcher if my Blackberry KEY2 is forcing an off-green accent color in the notification menu, and settings menus? It creates a maddeningly inconsistent software experience. Mixing and matching themes from the Samsung store with the accents from the Microsoft Launcher, and the huge range of icon packs available in the Google Play Store, allows you to make something that at least approaches the visual consistency of Windows phone. And while we're on the topic, you can strip out practically every Google service, and every Samsung service and replace them with Microsoft's own. Bixby? Replace with Cortana and a Bixby button remapping app. Chrome? Replace with Edge. And so on. One of the chief complaints I hear from techies about Samsung's phones is that the software is bad, or bloated. Personally, I haven't found that to be the case. There are a lot of extraneous software experiences, such as Bixby, and I'm not a fan of Samsung's own launcher or its "edge" menu feature. Thankfully, you can disable the vast majority of this stuff, and still, plenty of the software it offers is useful. The camera app for Samsung phones offers similar amounts of control as the famous Lumia camera did back in the day (although, so do most Android phones nowadays), with a range of additional benefits that extend some of the work Microsoft had attempted with its Lumia phones. Additional features like Bixby Vision, which identifies contextual information from your images and offers search, translation, and other A.I.-assisted solutions, work really well. The Google-powered Bixby AR translation service blows Bing Translate out of the water. There is a range of other Bixby Vision apps that complement the camera app, such as Amazon Assistant, which helps you find price comparisons simply by photographing a product. I'm also a big fan of how easy it is to crop, ink, and annotate screenshots on a Samsung Galaxy device, very closely mimicking what you can do on a Surface with the new Snip & Sketch features in Windows 10. Many things I came to love in Windows phones, such as the Kid's Corner feature, motion photographs, and early attempts at visual search with Cortana, really came to fruition in Samsung's phones. Many of its competitors offer similar functionality, but Samsung's software is easier to use, while also providing a consistent design experience. Samsung even offers a Continuum-like experience in Samsung DeX, which frankly blows Microsoft's own efforts in that space out of the water, especially now that you don't even need a dock as per the most recent Galaxy update. After Samsung's big OS refresh recently, I went from simply liking my phone to loving it. Friendlier, gesture-based navigation, new features like screen recording, and a consistent experience throughout the OS really conjured the best memories of Windows 10 Mobile, while leaving the nightmares like the app-gap and the crash-tastic software behind. Samsung's continued support of inking, wearables, and its foray into folding devices offer a glimpse at Microsoft efforts that should have been. And all of the best Microsoft services are available on Galaxy phones, too, including Office, OneDrive, OneNote, Edge, Cortana, with Windows features like timeline and tasks baked right into the Microsoft Launcher itself. I'm by no means suggesting Samsung's Galaxy line is perfect, but it's the closest I've come to actually, well, caring about mobile tech in a long time. What phone are you using nowadays? Hit the comments, let's talk.